Francis Ford Coppola is suing an Oregon-based wine producer claiming that its Copa Di Vino “Winemaker’s Cut” infringes upon the trademark for his own “Director’s Cut” wine, according to a lawsuit filed on Tuesday. 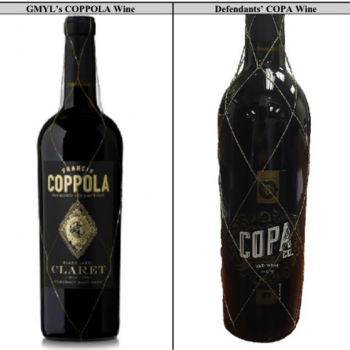 GMYL, which controls the Coppola wine trademarks, says that Copa di Vino’s Winemaker’s Cut intentionally mimicks Coppola’s “Director’s Cut” label in order to mislead consumers and trade off the brand’s success. It also claims that the producers intentionally imitated its Coppola Diamond Collection Claret, which boasts a black label. Several side-by-side comparisons of both producers’ producers were embedded in the lawsuit. It claims the bottle design is “confusingly similar” to its own trademarked brand. “Given Defendants’ use of a trade dress virtually identical to GMYL’s Black Label Trade Dress in connection with identical wine products in identical channels of trade, consumer confusion is not only likely but inevitable,” states the complaint. GMYL is seeing damages and “injunctive relief” for what it calls the defendant’s “intentional and wilful infringement” of its trademark. “Defendants are using labels and packaging that are virtually identical to the labels and packaging used for GMYL’s Diamond Collection Black Label and Claret Wine, the flagship wine of GMYL’s Diamond Collection”, the lawsuit states. GMYL is suing Copa, and its owner James Martin, for trademark and trade dress infringement and unfair competition, according to the complaint filed in California federal court Tuesday. An accomplished vintner and controversial filmmaker, Coppola has won writing Oscars for Patton (1970) and The Godfather (1972), as well as three Oscars for The Godfather, Part 2 (1974). His seminal films include The Conversation (1974) and Apocalypse Now (1979), among many others. He founded The Francis Ford Coppola Winery, near Geyserville in California, under Francis Ford Coppola Presents – a lifestyle brand which includes films and videos, resorts, cafes and a literary magazine. Located on the former Chateau Souverain Winery, the winery displays several of Coppola’s Oscars along with memorabilia from his movies, including Vito Corleone’s desk from The Godfather and a restored 1948 Tucker Sedan as used in Tucker: The Man and His Dream. This lawsuit is a JOKE. This winery has a very bad reputation in my eyes as a Wine Columnist. The worst tasting I every had was at Coppola’s Winery and not one person from the winery even contacted me. The servers in the tasting room were on their cell phones, Two of the wines were corked and not one of the servers knew what that meant. They thought it meant the wine bottle had a cork in it. (LOL) Kids were running in and out of the pool into the tasting room. Area was very crowded. As a result of this experience, I will not go to this winery. It does not surprise me that Coppola is suing another winery on a frivilious law suit. They continue to establish a bad tone in the California Wine Industry! juice in the bottle they are bigger fools!